NASHVILLE — Advancing equity, strengthening advising and improving pedagogy and curriculum were among the issues explored this week at the annual meeting of Achieving the Dream. Dr. Karen A. Stout, president of Achieving the Dream, addresses the conference. The four-day conference, now in its 14th year, has been an opportunity for community college leaders to share best practices on a wide array of topics that range from providing support for student advising to helping students who encounter financial challenges remain in college. 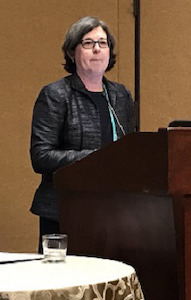 Dr. Sara Goldrick-Rab, a well-known professor of Higher Education Policy and Sociology at Temple University, delivered a rousing address about the problem of food insecurity, housing insecurity and homelessness among college students. Goldrick-Rab, who recently won the Grawemeyer Award for Education — which came with a $100,000 prize — donated the funds to help college students who encounter financial emergencies and want to stay in school. The Work Students Success Network (WSSN) recently issued a report that described some of the barriers that low-income students face and identified practices that can make a significant impact on student success. WSSN is a consortium of 19 community colleges in Arkansas, California, Virginia and Washington that was launched in 2014 by a group of philanthropic organizations. These colleges are working with Achieving the Dream. The goal of the consortium is to address the broad financial issues of low-income students and use a holistic approach to find new and comprehensive ways to advance retention and success. At the conference, community college leaders said there are immediate things campuses should do to address food insecurity. They include starting a food pantry on campus. “It also provides a key entry point for colleges to engage students and determine what other challenges they are facing, so colleges can offer additional services to help students persist, complete and achieve financial stability,” the report said. For example, at Porterville College, financial aid staff conduct a short interview with students visiting the food pantry and obtain information about the students’ living situation and possible needs. Staff then offer coaching and additional high- or low-touch services.